Introduction: In rare instances, we are able to re-operate on patients laparoscopically who have had previous hernia repair surgery with mesh. In this single case report, we highlight a patient who underwent incisional hernia repair with Strattice biologic and then 13 months later underwent an elective laparoscopic procedure for acute cholecystitis. At the time of surgery we biopsied a small piece of the intact mesh to examine it histolgically for evidence of inflammation, incorporation, and re-vascularization. Methods: Proper consent from the patient was obtained. All histologic findings were outsourced in conjunction with LifeCell Corp and to our own Department of Pathology.Results: Through laparoscopic interpretation, we found no evidence of hernia recurrence as the source of the patient’s pain. The Strattice mesh was examined bluntly and a small biopsy was taken inferiorly measuring 0.4 cm. A standard H&E slide was done demonstrating fibrous tissue with a small focus of hemosiderin. Further analysis by the manufacturer demonstrated no evidence of collagen breakdown, no inflammatory cells, and high rates of re-vascularized native tissue. In light of these findings, we notice that swift incorporation of the mesh to the abdominal wall might not be as quick in this patient population as in other hernia repair test groups. Conclusion: On rare occasions such as these, we are able to extensively analyze the efficacy based upon inspection and associated pathologies. 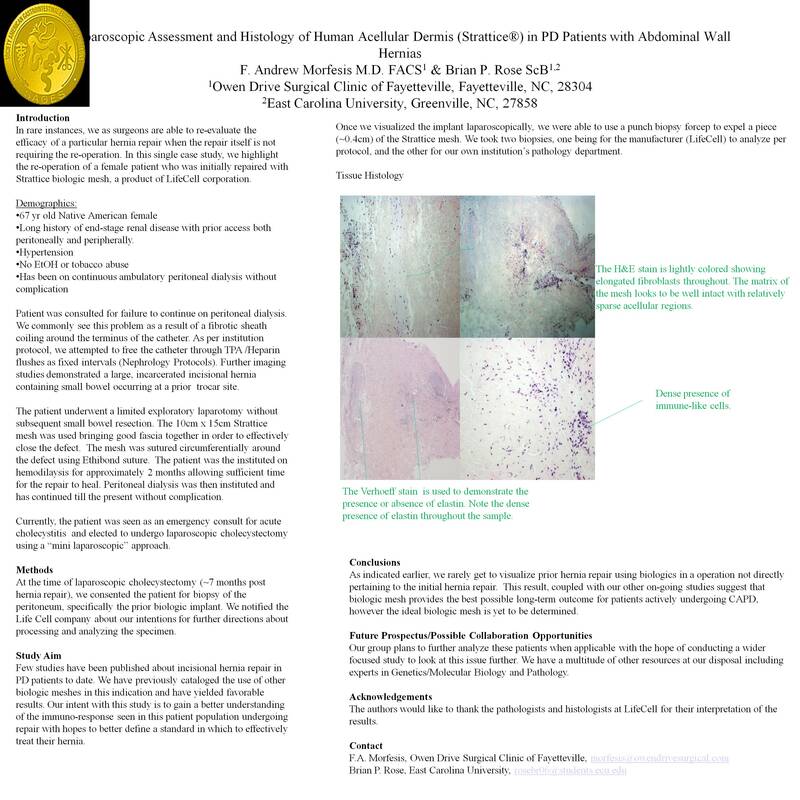 Our result provides support for using biologic mesh in peritoneal dialysis patients presenting with abdominal wall hernias. Future Prospectus: It is our groups hope to further analyze this population for other factors such as cytokine recruitment and a separate infection control study in vitro.